Retail $24.50 SAVE 23% ! Strong steel construction with rubber grip handle Great for cutting electric wires, photo etched metal & small diameter soft metals, plastic model sprue trees and much more. I wanted a better sprue cutter that made sharper cut and left less excess plastic. I think these work reasonably well and tend to use them on smaller and more delicate pieces.. The best out there. My go to sprue cutters. I don&apos;t use these for anything but plastic to preserve the very sharp cutting surfaces. Very little effort needed to cut parts from sprues. Cuts very close to parts so minimal clean up is needed. There is no better sprue cutter for this price. 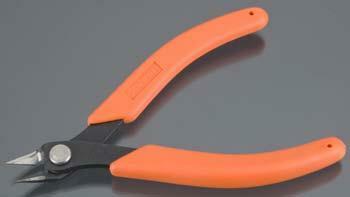 It is very sharp for a sprue cutter and cuts very flush in all plastic. With this cutter I can confidently cut right up to the plastic because it won&apos;t warp anything. If it cuts too deep, then I use like a milligram of putty to fill up something. It has a spring that will bring the cutter back to it&apos;s original position and the tension is just perfect for making tiny squeeze adjustments. There is nothing better than this.